Chapter 13 lien stripping is a process where homeowners can eliminate a 2nd or 3rd lien such as a Home Equity Line of Credit. If the value of the home is lower than the amount that is owed for the 1st mortgage, it is possible that a 2nd or 3rd mortgage can be eliminated. Lien stripping was uncommon in previous years, but with the recent drop in the housing market, lien strips have become more frequent for borrowers that file a Chapter 13 Bankruptcy. As a general rule, when a person files bankruptcy, unsecured debts can be eliminated. Those debts include credit cards and medical bills, as well as personal loans or revolving lines of credit for businesses. Secured debts, which have property or collateral attached to them, cannot typically be eliminated in a bankruptcy. Those include mortgages and car loans. Homeowners who have seen the value of their property decline may qualify for a lien strip by filing Chapter 13 bankruptcy. Homeowners are only eligible for second mortgage lien stripping in certain circumstances. A lien strip is only possible if the balance of the 1st loan owed on a home is more than the value under the current fair market conditions. An appraisal determines the fair market value, and the bankruptcy court will allow the holder of the lien to dispute the value determined by the appraiser. Which liens can be stripped with chapter 13 lien stripping? Chapter 13 lien stripping allows homeowners to get rid of wholly unsecured liens on their property. That means that a person must be upside down completely; no equity can remain for a lien to be stripped. A court will look at the order of recording to determine which lender is 1st or 2nd or 3rd. The priority of any mortgage or lien on your property is determined by the date it was recorded with the local county. In most cases, 1st liens that are recorded earlier have higher priority as compared to loans that are recorded later in time. In cases where the second mortgage lien is considered wholly unsecured, the lien can be stripped through Chapter 13 bankruptcy. The second mortgage cannot be secured by any amount, an all or nothing approach is required when discharging mortgage loans. This means that the second mortgage cannot be secured by any amount of equity. What happens to stripped liens? The stripped liens are treated the same as other unsecured debts during bankruptcy. Small amounts of these debts are paid while the rest are wiped out on completion of your Chapter 13 bankruptcy. The lender is required after discharge to remove the lien from your property. How does foreclosure affect 2nd liens? In the case of a foreclosure sale, the first mortgage lender gets paid before any amount is paid to the second or third lenders. In many cases, there is nothing left over from a foreclosure sale to pay the second lender after the first mortgage has been paid. A foreclosure eliminates a 2nd lien that is not paid with the proceeds of the sale. 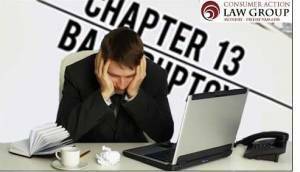 For more information about Chapter 13 lien stripping and how to eliminate a second mortgage lien, California residents can consult with our Los Angeles Bankruptcy Attorneys for free; call 818-254-8413 for a free consultation today! Can't Afford to Pay Your Debts? Our Bankruptcy Attorneys can eliminate your debts! We Eliminate Credit Card Debts, Medical Bills, Personal Loans, Wage Garnishment..